Rotating 270 degree connectors on each end move from side to side in almost a complete circle! 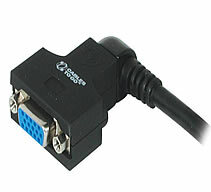 This cable has a resolution of UXGA 1600 x 1200. • Connector Size: 1.85in L x 1.325in W x 0.6in H.
The oversized thumbscrews are slotted for easy connection to your equipment. Constructed from three coax and four twisted pair with an overall foil and braid shield, this UXGA cable supports the highest resolution video signal. With its premium quality and incredible versatility, this UXGA cable is ideal for connecting video equipment including projectors, video splitters, monitors, and KVMs. 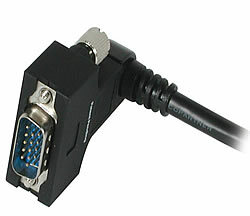 With VGA270, the days of not having the right connector orientation on your cables are over!